This is the beautiful new chapel on the campus of Thomas Aquinas College in Santa Paula, California. Dedicated on March 7, 2009 following 10 years of planning and construction. Noted architect Duncan Stroik was called upon to design this magnificent building and a fine job he did. 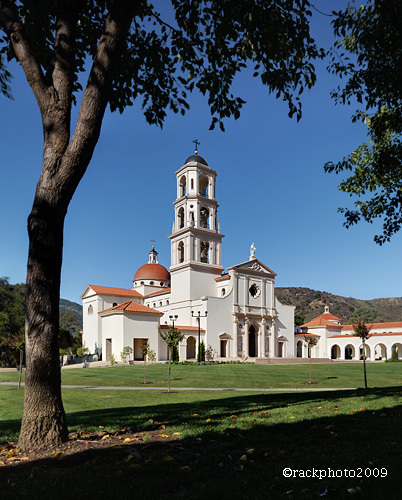 This series of panoramas of the Chapel was part of a larger project consisting of 25 panos of the entire campus for inclusion on the Thomas Aquinas College website. See all of them here. The next panorama is actually 2 views from the same location, one taken in the morning the other in the evening. If you click on the Day/Night button you can switch back and forth between the 2 views. You won’t want to miss this next one, the viewpoint is 6 feet outside the second level of the Bell Tower, hold on and don’t look down!